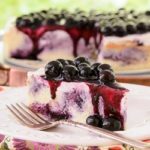 This blueberry swirl cheesecake is crustless, has blueberry filling swirled throughout, and is topped with a creamy layer and fresh blueberries. Combine 2 1/2 cups blueberries and 1 tablespoon cornstarch in a blender. Blend until smooth. Cook puree in a small saucepan over medium-heat for 13 minutes, stirring constantly. Remove from heat and cool to room temperature. Reserve 1/3 cup cooked puree for topping. Preheat oven to 325°F. Grease a 9-inch springform pan. Beat cream cheese in a large bowl with an electric mixer on medium speed until creamy. Whisk together 1 cup sugar, remaining 2 tablespoons cornstarch, and salt in a small bowl. Gradually add to cream cheese, mixing well. Add eggs, beating well after each addition (beat on medium speed). Dollop blueberry puree on batter. Gently swirl puree into batter with a knife. Bake for 1 hour, or until set. Remove from oven and cool on wire rack for 20 minutes. The cheesecake will crack. It's okay because it will be covered up. Stir together sour cream, 2 tablespoons sugar, and 1/2 teaspoon vanilla in a small bowl. Spread on top of cheesecake. Bake for an additional 10 minutes. Cool cheesecake on a wire rack to room temperature. Cover and chill overnight. Combine 1/3 cup reserved blueberry puree, 1/4 cup sugar, and 1/4 water in a small saucepan. Cook over medium heat, stirring constantly, until thickened (about 10 minutes). Gently stir in 1 1/2 cups blueberries. Cool to room temperature. (Or make in advance and chill with cheesecake overnight). Remove sides of springform pan. Spoon topping over cheesecake.